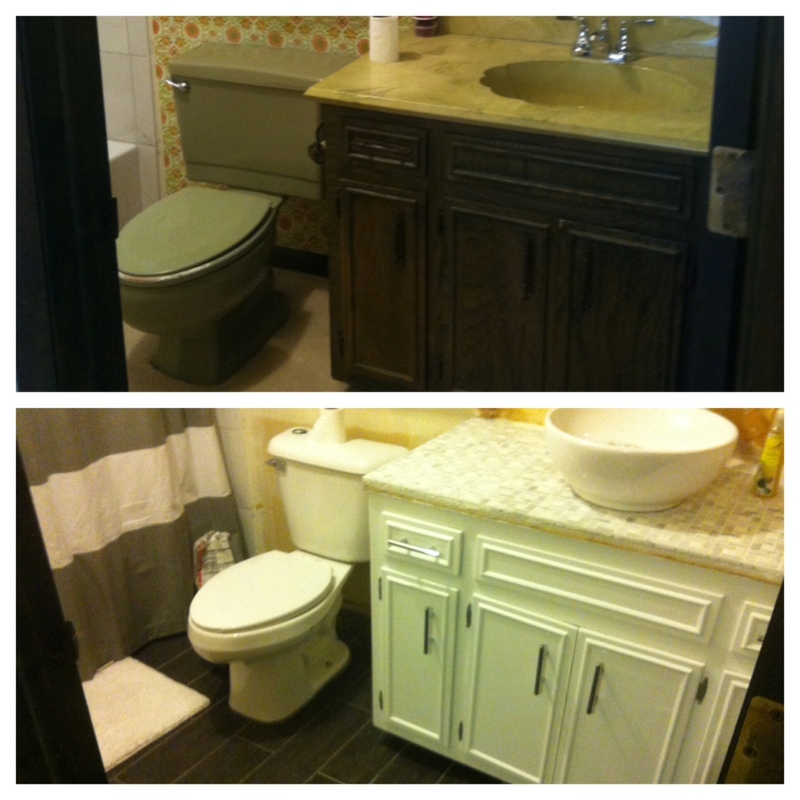 Creating the DIY vanity top was a process in trial and error…a lot of error, but we eventually mastered it! I started by removing all the marble countertop and placing it at the curb. Even though it was insanely ugly, somebody wanted it! 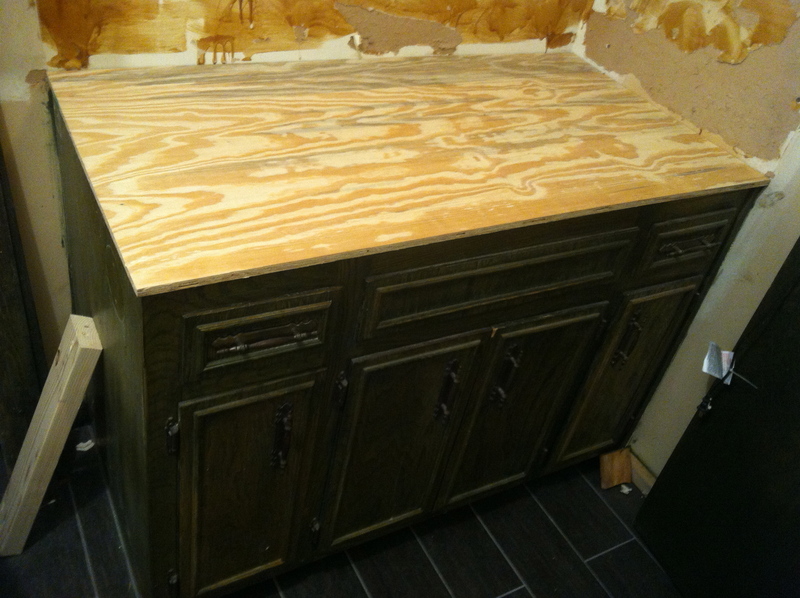 Once it was removed, I decided to use plywood to act as a base surface for the countertop. There are various depth of plywoods, and I don’t think it matters which depth you use. 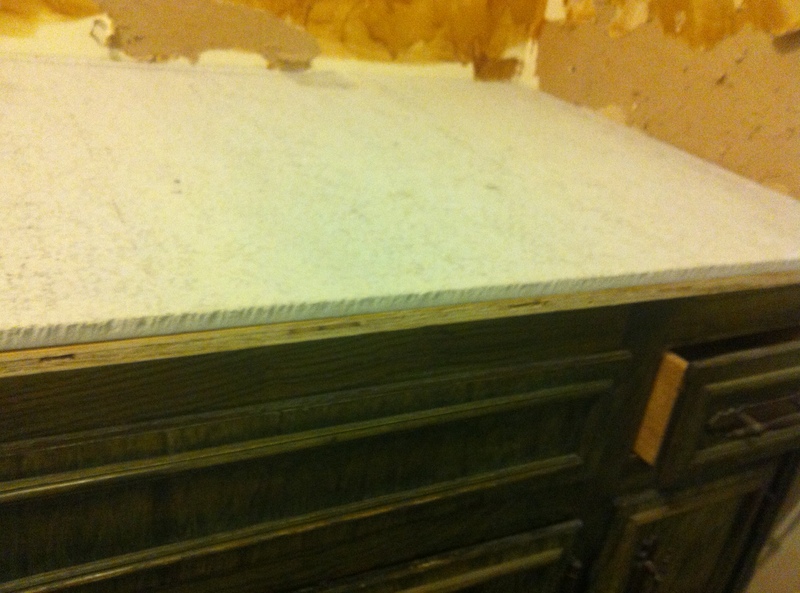 I was trying to add height to the countertop, so I chose thicker plywood. 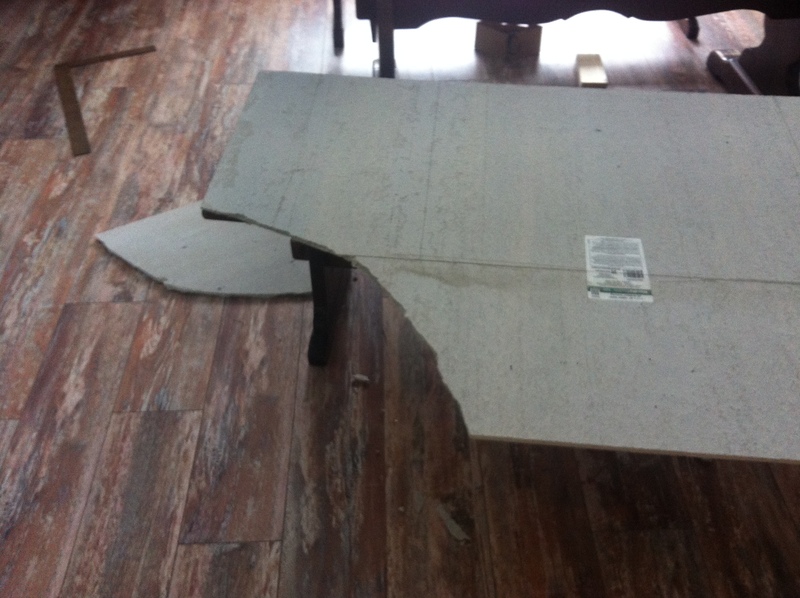 While they had pre-cut plywood, it was the same price as a large sheet. I chose the large sheet and had my uncle cut it down to size (45″ width and 22″ depth). 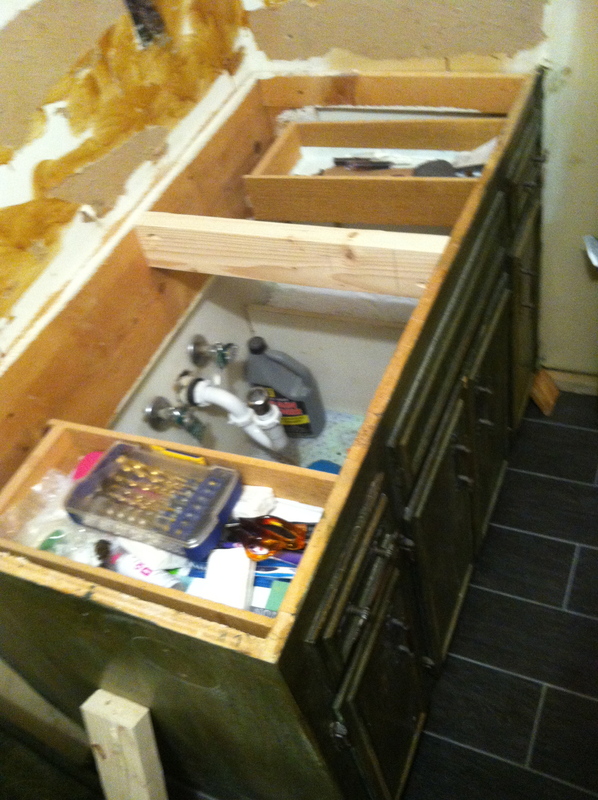 After we had the plywood cut to size, I attached it to the existing cabinet using liquid nails. I gathered rocks, bricks, tiles, and books let them sit on the plywood for a couple days. While they make grip devices, I don’t have any, so I improvised. The next step was to purchase a diamond saw at Lowe’s. Even though it was quite messy, it was a lot faster and easier to cut the cement board. 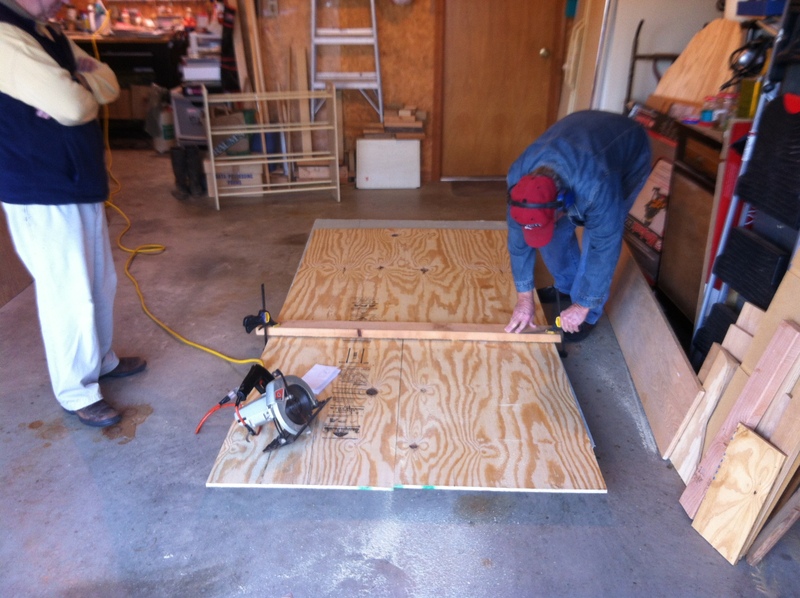 Once it was cut, I placed the cement backer board on top of the plywood (do NOT attach yet!). The reason I did that was so that I could trace the holes from under the sink so that the holes would perfectly align between the plywood and cement board. After I had the trace holes drawn on the cement board, I used a diamond drill bit to drill two holes in the board (again, I’d make the drain hole at least twice the size of the original drain hole). Once I had the holes drilled, I used more liquid nails to attach the backer board to the plywood. The next step was to add the tile. 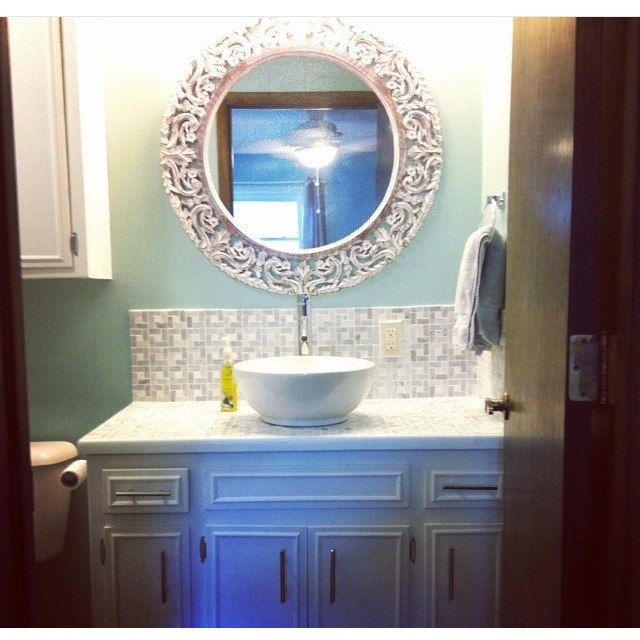 I chose marble 12×12 tile sheets from Lowe’s. The marble pattern matched the tile from the shower. I suggest investing in tile snippers and I laid out the tile sheets in the order I wanted them on the board. I tried to vary the dye patterns. Once I had them laid out, I used a sharpie and numbered them on the back of each sheet. 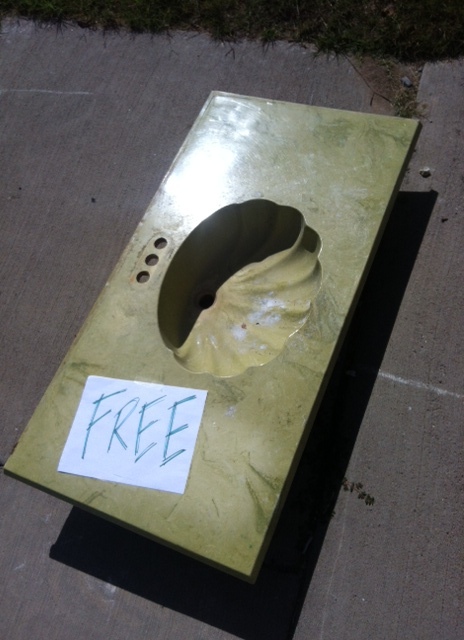 I then wrote on the cement board the corresponding number so I wouldn’t get confused where each sheet went. I had leftover glue from the laundry room backsplash, so I used that glue to attach the tile. 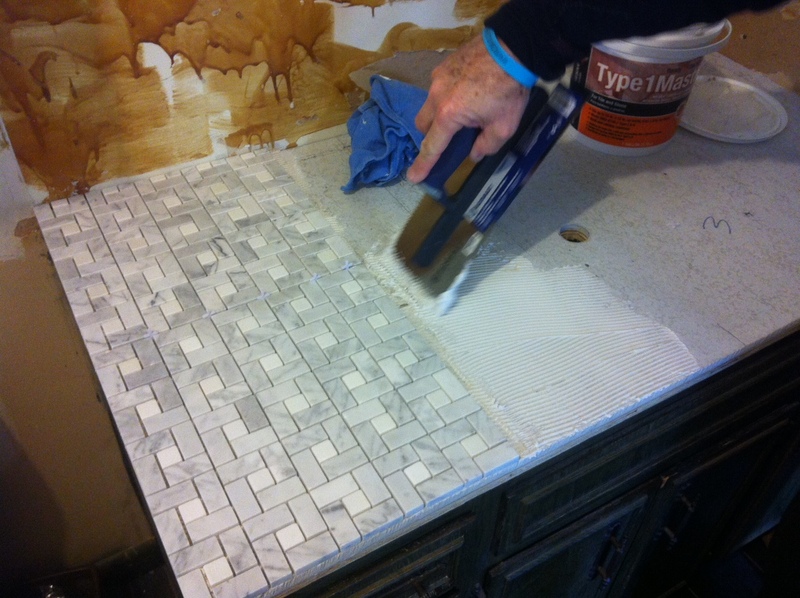 It was my first time tiling, so Dad taught me a few tips. It was really easy. A little goes a long way. I suggest starting with the tile sheets that go at the front of the cabinet so that any cuts will be at the back by the wall (less visible). I did have to cut some tiles off (which is easy because they’re on mesh) and I had to snip a few. The snippers make it quite easy. 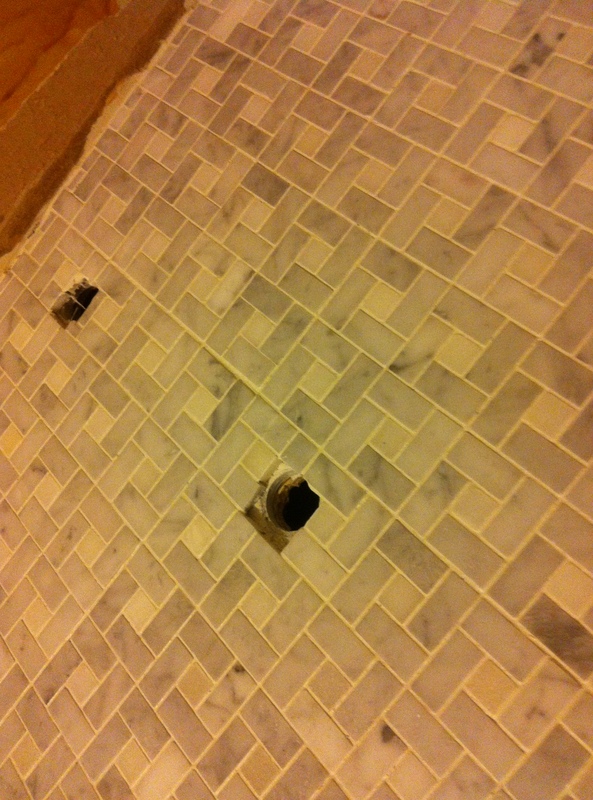 I also had to snip tiles around the two holes for the pipes. I had leftover grout as well, so I used that same grout on this project. Grouting was just as easy as glueing. After we grouted, we waited a couple days for the grout to set before proceeding to the next step. 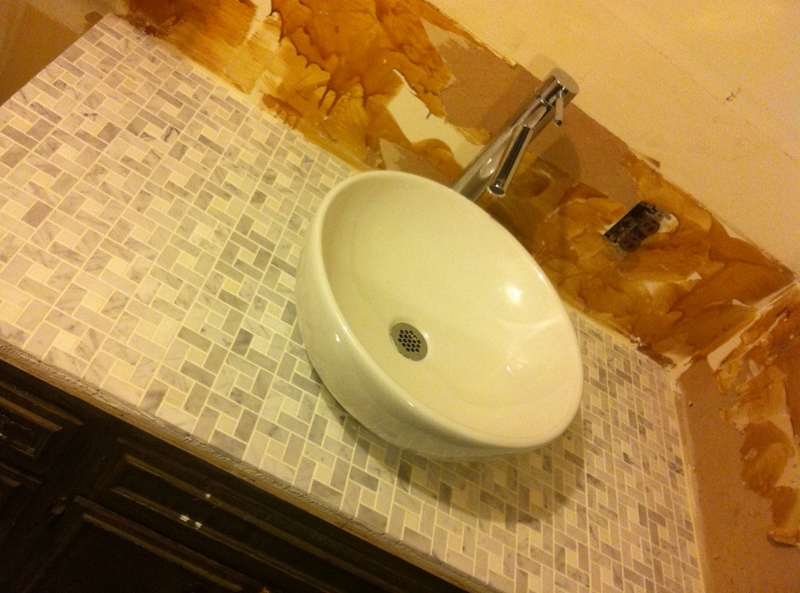 Once it was grouted, then I started the fun part! Since this setup requires a vessel sink, I had to choose a faucet designed for a vessel sink. Vessel sinks are typically higher, so standard faucets aren’t designed for them. I wanted a very clean and modern one, and Lowe’s didn’t have any. I eventually found one at Home Depot. Adding the faucet was as easy as sticking the two mesh cords through the hole and tightening the ring underneath and hooking to the water lines. Very fast and easy! Next was adding the sink. That was a bit trickier, but we eventually figured it out. I loved how the countertop turned out! The front part is an odd depth, so trim tile won’t work. I plan to add wood trim. After I finished the countertop, the next stop was to paint. I used some leftover primer and paint and added five coats. 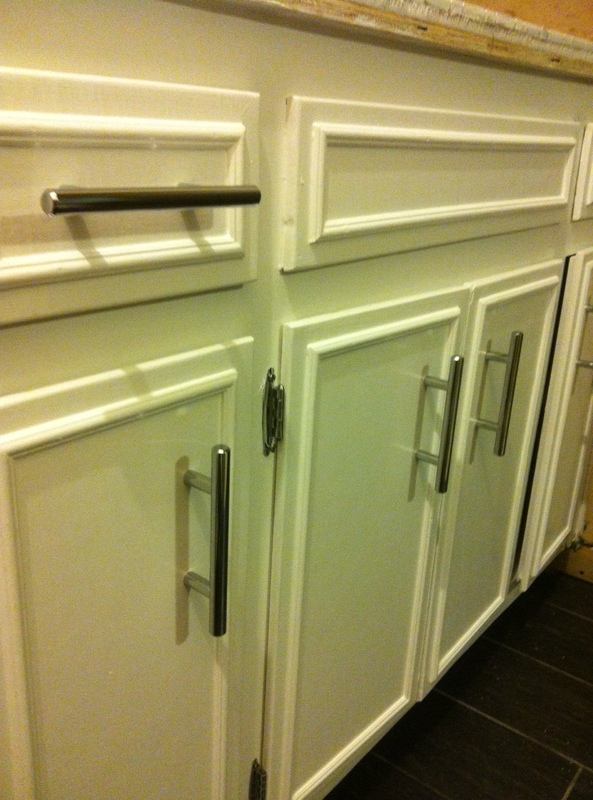 I removed the old (ugly) hardware from the cabinet, patched the holes, and sanded prior to painting. I am using all chrome in this bathroom to match the faucet in the new shower, so I needed the new hardware to be chrome. I also wanted the hardware to be clean and modern. I found exactly what I was looking for on Ebay and with free shipping! For less than $15, I had brand new hardware for the cabinet. 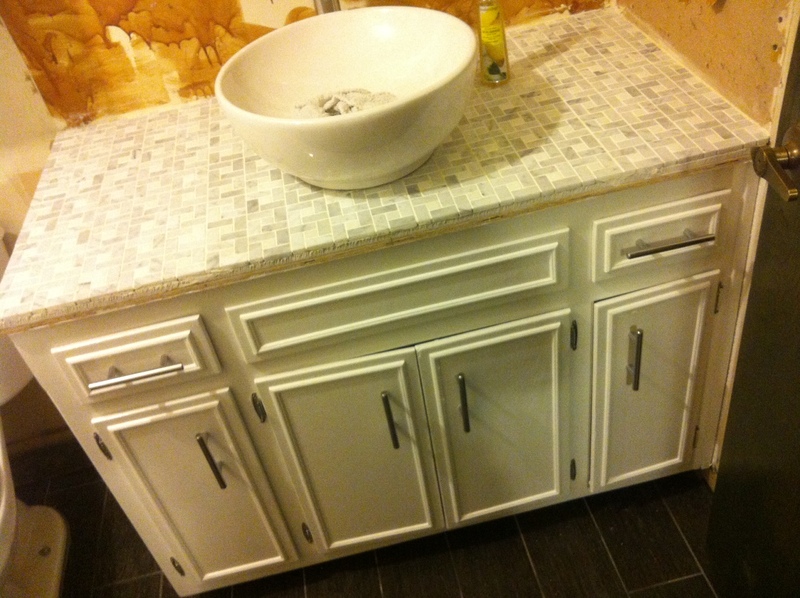 Except for the trim, the vanity is done! I still have to address the wall situation and find a mirror, but the master bathroom is already looking so different! Did you sand the cabinet before priming? Stunning. I am doing it! 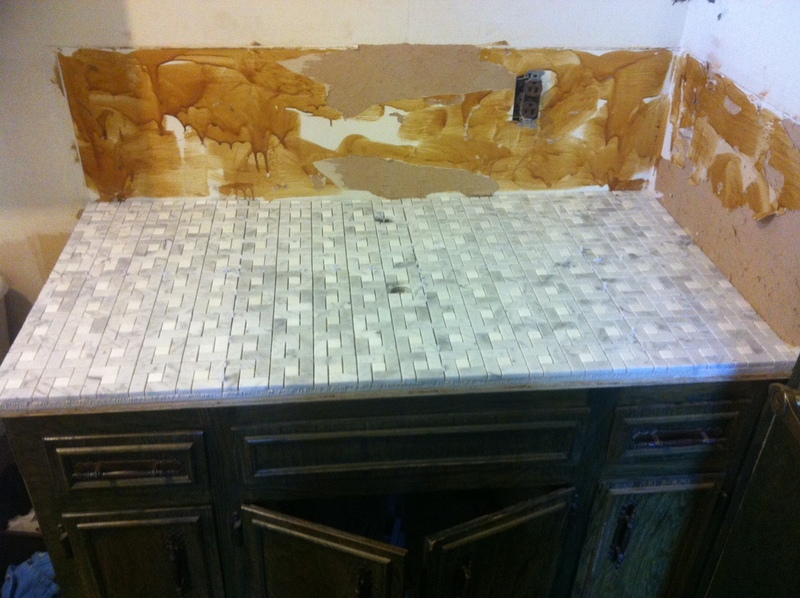 I am curious as to why you didn’t finish the backsplash area before installing faucet and sink? ?